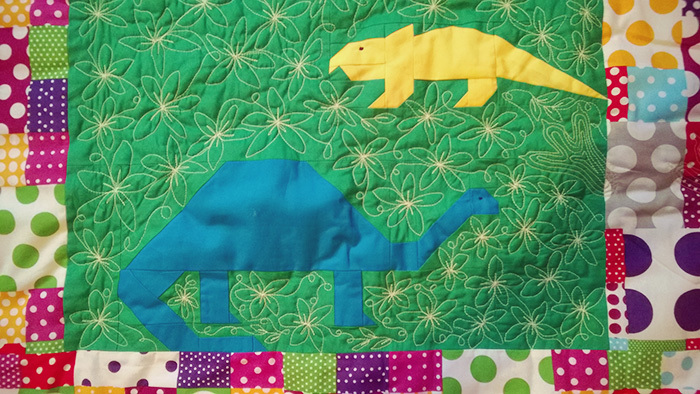 This was another one that I made from the ‘Patchwork Quilts to Make for Children’ book by Margaret Rolfe, for my niece, Clara. 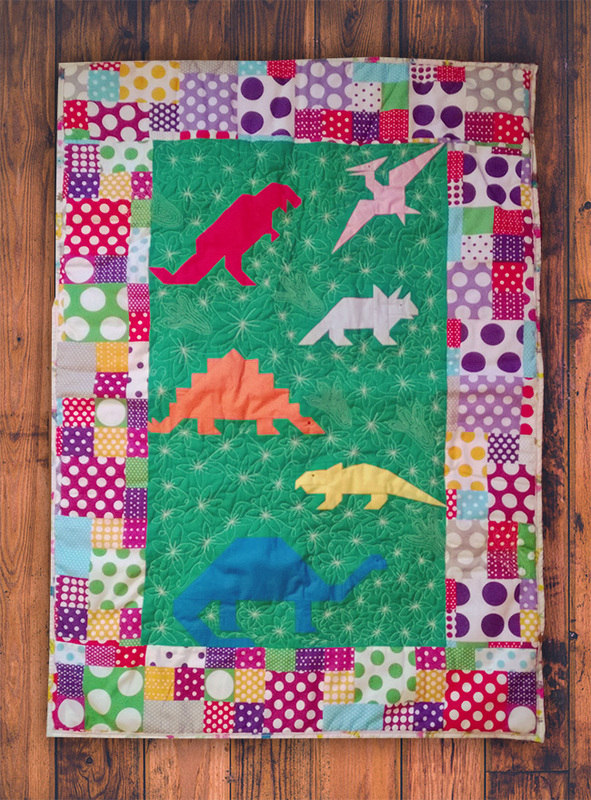 In the book, Margaret had used plain black fabric for the dinosaurs, and a green and blue patterned jungle fabric for the background, but I wanted this quilt to be a bit more colourful. I made each dinosaur a different colour based, where I could, on the colours of the dinosaur zords in Power Rangers the Movie (a favourite of mine and my brother’s). For the border I used the leftover fabric from the back of our wedding quilt (the squares are not stitched together but printed! 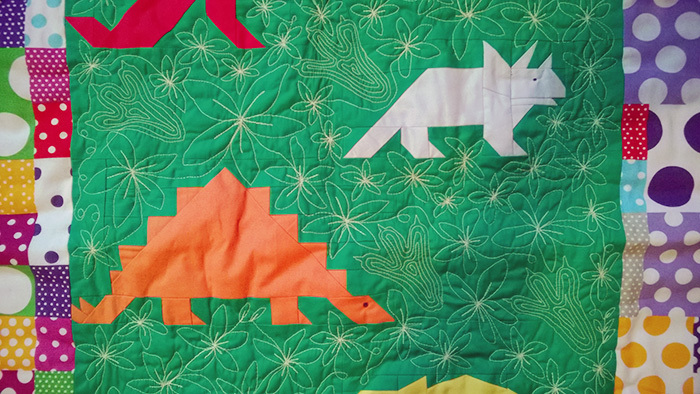 ), and the back of the quilt is a pink fabric with cartoon dinosaurs on. I decided I’d like to do a set of dinosaur footprints “walking” across the quilt so I drew a template on paper, and then drew around them with a vanishing fabric marker. Is sewed from the outside in a spiral until I reached the middle. Then I free-motion stitched five petalled flowers in the remaining background. It took a lot of concentration, and I only managed to do around 20-30 mins of this at a time. 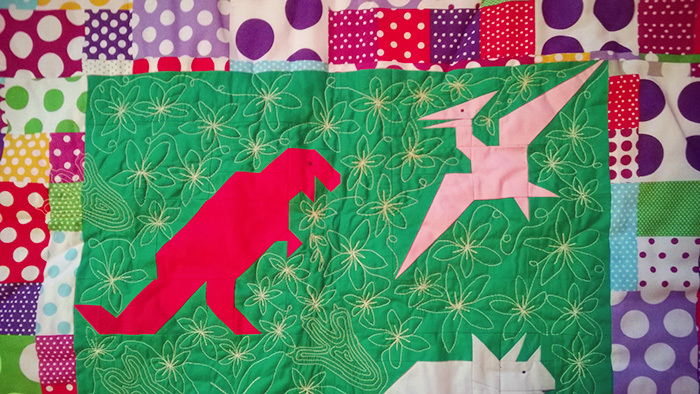 Finally I stuck eyes on the dinosaurs, again with the sewing machine. I was pleased with the final result and I hope she liked it!